The first quarter of the year found us fishing for speckled trout, redfish, bay snapper (sheepshead), flounder, white trout, and black drum. Fishing along the granite rocks during these months can be very exciting. Giant Bay Snapper will be en route from the Gulf of Mexico to the passes and jetties for their annual spawn. Each day it seems more and more of these intriguing fish show up along the jetty rocks. 2016 Bay Snapper catches were absolutely amazing with many fish tipping the scales over 10 pounds. The sheepshead is argued amongst old timers to be the best table fare caught in Galveston Bay with white flakey fillets and an amazing texture and taste. Full limits of these fish came most regular during 2016 and many bags of fillets went home with happy customers. Mixed in with the Bay Snapper are some extremely nice speckled trout. This is the time of year that trophy speckled trout are caught along the Galveston Jetties. The quantity of fish may not quite be there with the amount of Bay Snapper competing, but the quality is second to none. Many nice slot red fish hit the deck during the first quarter of 2016 and was a great bonus to an already full box of fish. 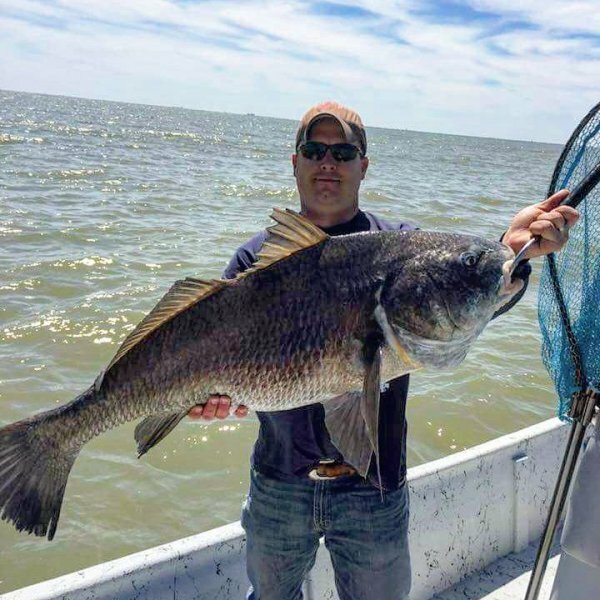 It is hard to talk about February and March fishing without mentioning the Enormous Tanks that are more commonly known as Black Drum that will test the skills of amature and experienced anglers alike with their power and strength. We had a great year of Black Drum Fishing with two first place finishes in the Turning Point Tournament. Captain Ernest took first place honors in the adult division with Captain Greg earning first place in Youth Division. Galveston Flounder Gigging during January and February can be quite dramatic with quick limits on some nights. Water clarity during these months are very good as temperatures stay low which results in crystal clear water as the norm. The most flounder I have seen on any given night in a short stretch of bay bottom was February. I believe I caught the elusive glimpse of a large group of flounder making their way back into the bay system from their Gulf Spawn. The back lakes and bays produced some very nice redfish, specks, sheepshead, puppy drum, and flounder during January, February and March. With weather and winds being up and down - we found refuge in these areas and put some solid boxes of fish together. The bay and marsh is not only a great area to hook into some nice fish - the scenic beauty in itself can be the icing on the cake. April is what I call a transition period for most years on Galveston Bay, and 2016 was a typical year for this except for the fact that the speckled trout bite turned on sooner than usual. April was still a great month for Bay Snapper, but the speckled trout and redfish numbers turned on half way thru the month. 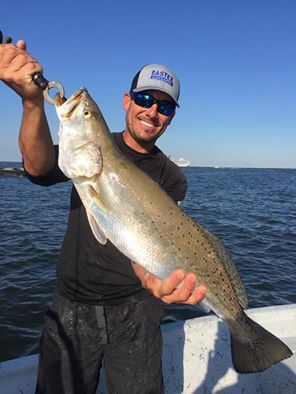 Captain Clint caught his new personal best record speckled trout during April that tipped the scales at an exact weight of 10 pounds. 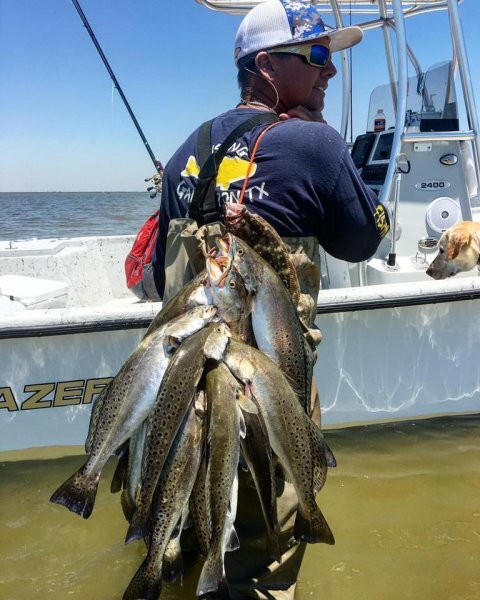 More than usual numbers of specks were along the Jetties during April, and I believe this was due to the amount of rain fall Texas had which pushed fish that would have typically been scattered in Galveston Bay to areas of greater salinity which the Galveston Jetties provide. The speckled trout and redfish bite continued to get better throughout the second quarter of 2016 and some very nice catches along the Galveston Beach Front were made. The sharks presence were not quite as heavy during this time due to the freshwater flow leaving the bays from the more than usual amounts of rain fall Texas experienced. The Bays and Marshes were great areas to fish when rain fall subsided and the runoff cleared out. Red Fish are the best for adapting to fresh water runoff and some nice slot reds were caught along with large numbers of smaller redfish that are great fun to catch, but must return to the waters to grow. The most amazing redfish I have ever seen came on May 29 from this area. With 39 spots - this unbelievable red fish was one of the many high lights of 2016. June 1 marked the opening day of Red Snapper season, and some very nice catches were made when were able to get out there. 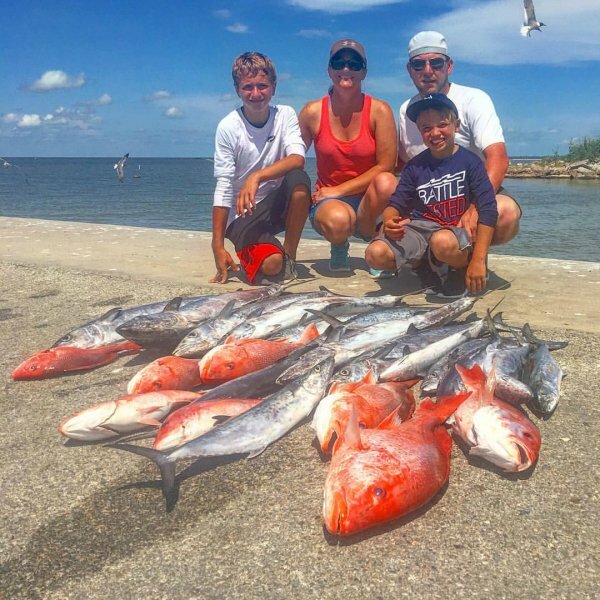 King Fish and Red Snapper along with some nice cobia hit our decks in the blue water this year, and with the most affordable prices for Offshore Fishing in Galveston - we were quite busy. 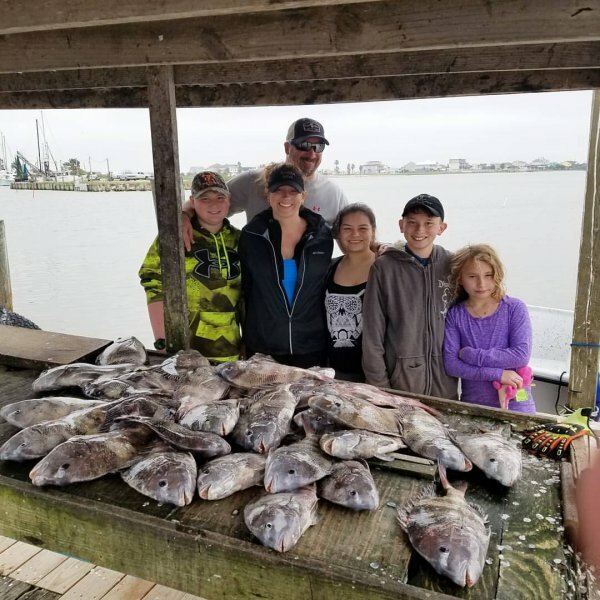 Our Galveston Summer Kids Fishing Camps also kicked off in June, and we had another fantastic year of teaching kids the fundamentals, safety, and secrets of fishing. We will once again have this popular camp for kids during summer 2017 - June thru July. This quarter is typically the most busy time of year and also can be the most productive. This is the one time of year that most any species of fish may be caught, and 2016 proved this once again. 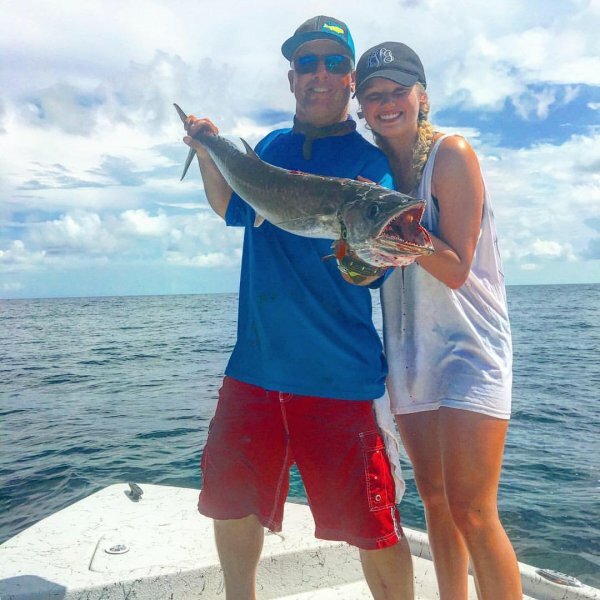 With a dramatic number of speckled trout being caught along with sharks, redfish, tarpon, cobia, red snapper, pompano, flounder, black drum, white trout, jack crevelle and more - we were quite busy and our fillet knives got a work out. Bays and Marsh fishing was very hot during this quarter for those that were looking for a more secluded trip on some calm shallow water flats. As many areas of Galveston Bay can be congested during July and August - we have an area that can get you away from the crowds and at times make you feel you are the only boat on Galveston Bay. Offshore fishing thru these months were great, and some exciting days of King Fishing and Cobia were had. The weedlines that we generally target for mahi mahi were non existant making the mahi bite not as productive, but the kings and cobia made up for this. 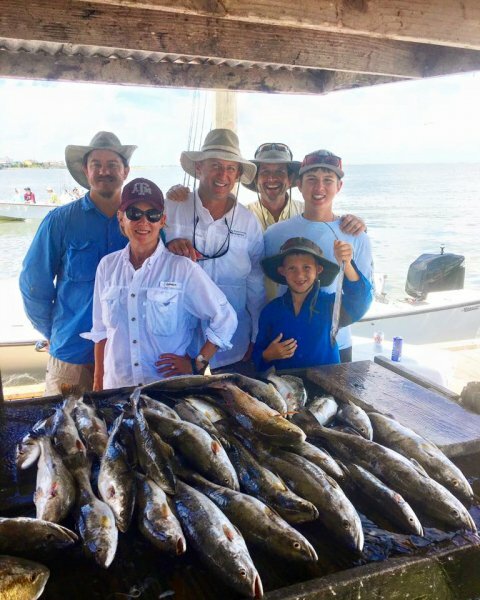 Galveston Bay Night Fishing was a smart way to beat the heat during this time, and if speckled trout is what you are looking for - sleep in during the day and come see us for a night time fishing adventure that yields spectacular results. 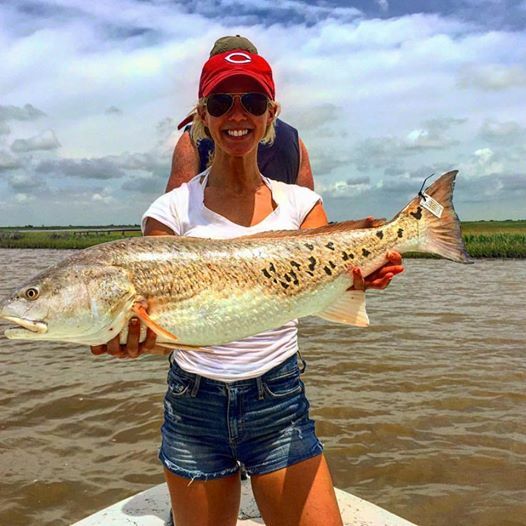 The last quarter of the year on Galveston Bay usually means Bull Reds along the jetties, slot reds in the marshes, speckled trout in the bays, and night time flounder gigging action. All of these were happening as usual except Mother Nature didnt cooperate for what is usually the most popular - Night Time Flounder Gigging. High tides mixed with high winds and warmer days hindered the flounder gigging the last quarter this year. On the other hand - some great fishing in the marshes made up for it along with some great catches of flounder on rod and reel. With so many options for Galveston Fishing along with a great group of Galveston Fishing Guides that we have - I predict another great year for our customers that fish with us. We have already begun with a great flounder gigging trip last night with 2 limits of solid Galveston Flounder, and are already seeing some nice Bay Snapper showing up along the Galveston Jetties. This is an exciting time of year for us and our Galveston Fishing Guides are gearing up for another year of great fishing with our returning customers, and are very stoked about the new ones we get to meet. 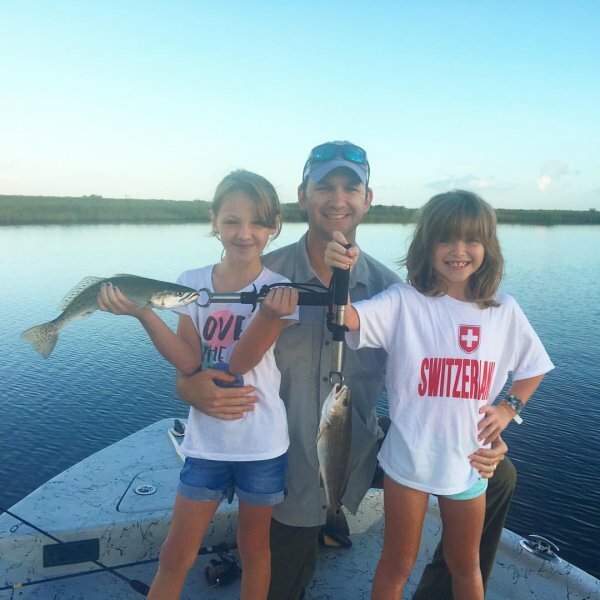 All of our guides are family friendly and love getting kids hooked up on some Giant Fish.